I was after something quick and tasty to cook for lunch today so this is what I made. 1. Place all of the above into a food processor, apart from the soured cream, and blitz to a smooth paste (this takes a few minutes). 2. Stop the processor after each minute or so and scrape down the sides to ensure that it is all evenly blended. 3. Adjust the lemon juice, salt and Cayenne pepper to your personal taste; adding a little more if necessary. This mixture will still be quite thick. 4. Mix in a couple of tablespoons of soured cream and blend further. 5. Continue to add the soured cream, a tablespoon at a time, and then blend until you achieve the right consistency. Personally I like it to ‘blob’ off the spatula. 6. 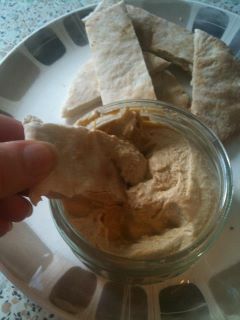 Serve with hot toasted pitta breads or vegetable sticks such as carrots, celery, peppers etc.